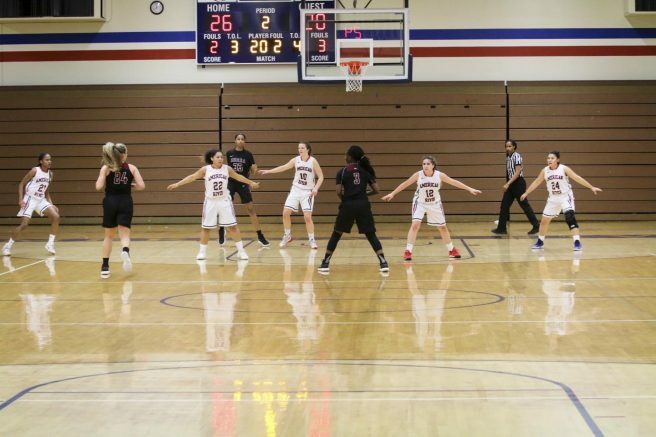 The American River College Beavers were swept away by Sierra College 92-71 in their first home game of the season on Tuesday Jan. 23, losing both games of the season series. Sierra set the tone of the game from the start by playing 12 players and having a frequent bench rotation, opposed to ARC, which only had one bench player and five starters. This possibly could have hurt them in the game and fatigued them early. The Beavers started the game strong but lost momentum quickly. The Wolverine’s defense was rock solid from start to finish and the Beavers couldn’t keep their defense intact. Press defense and repeat plays kept the Wolverines on top of the Beavers at all times. Once the second quarter hit the Beavers were down 20 points (32-52) and it looked like their energy and stamina were dwindling. However, the Beavers pulled it together to close the gap to a ten point deficit by halftime and they regained some confidence. The third quarter was filled with each team widening and closing the point gap. The Wolverine’s defense stayed consistent the whole game and was seamless between the players. The visitor bench rang with the Wolverines yelling “D- UP! (short for defense up) in unison with each other to support their teammates on the court. Defense was a big theme in Tuesday night’s game. The fourth quarter slipped from the Beavers and they plummeted back into another 20-point hole. With the tired Beavers unable to keep up, the Wolverines defense locked up the game for them and they went home with a win. Wolverines guard Taylor Avila credits her team’s win to them pushing the ball well, their defense and their ability to play in sync. s. However, Avila had an issue with her team’s communication on the court. “I feel like normally our team is very vocal with each other, but we weren’t as vocal this game,” Avila said. Beavers Guard/ forward Jasiah Sufi said she walked away from the game knowing her team has work to do. “I felt like our defense could’ve been better, we could’ve rebounded better, boxed out better. There’s a lot of things we need to improve on but were going to learn as a group,” Sufi said. Teammate and guard Valerie Viramontes said she felt that the Beavers let the Sierra get easy points, but was glad her team kept it composed and worked together. “We kept playing, and most teams would’ve gave up but we didn’t give up,” Viramontes said. The Beavers showed perseverance in Tuesday’s game and they’re looking forward to the rest of the season. In particular, Beaver’s guard Lekeshia Griffith is looking forward to playing against the teams the Beavers have lost to previously. “…beating all the ones [teams] that we didn’t for the first round, we got Sac City, DVC, and Delta,” Griffith said. Be the first to comment on "Beavers swept away by Sierra College"